This short tutorial explains how to create a routing plan with two vehicles. Choose a date, delivery times and number of vehicles, and click on next. For more information on this section, see the "Initial information" article. Visits are those places on a route marked for delivery. 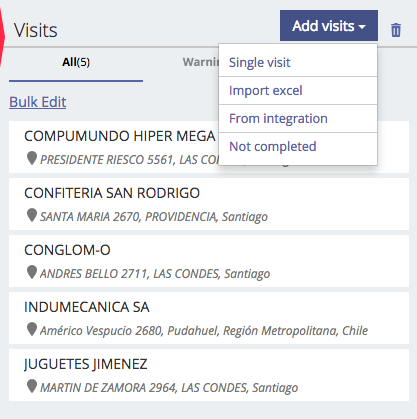 You can upload your visits one-by-one on a manual basis, loading a spreadsheet file (More information on spreadsheet files can be found in the "Importing visit information spreadsheets") or by importing addresses from your ERP system. To work with this tutorial, you can use the example Excel file called "Ejemplo Demo Pequeña" at the end of this page. 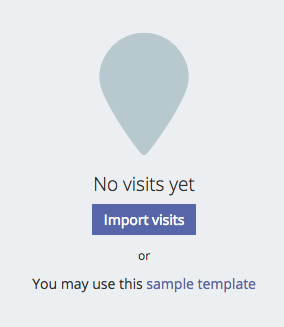 Download the file, click on Import visits, and upload the information. Once you upload the addresses, you'll be able to see them on the map on the right and as a list on the left. 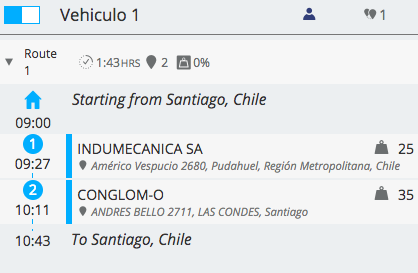 Next, click on Create routes to continue and optimal routes for the two vehicles will automatically be calculated. On the map you'll see the suggested route for each vehicle, along with the suggested delivery order. 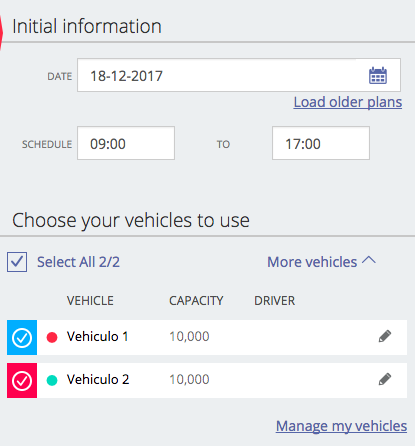 In the tope section you'll find delivery indicators, such as fleet use percentage, average time per route and average distance per route. On the left, you’ll see a list of your vehicles with their assigned stops. If needed, you can edit the routes by clicking on Edit. You’ll be able to transfer routes from one vehicle to another, arrange the order of visits, create new routes or delete them. For more information, see Edición de Rutas I or Edición de Rutas II. Click on Export if you want to download your results as a spreadsheet, PDF or text file. Click on Finish to send the routing information to your drivers. After clicking on Finish, a final assigning window will pop up. Here you can make the last changes before dispatching the routes to the drivers. You can choose drivers, change the name of the plan or leave comments. You can assign names to each delivery plan. We recommend including the date in name for easy reference e.g. "Delivery plan for Oct. 25th"
Click on Confirm to dispatch the routes to your drivers. Congratulations! You’ve just created your first routes. Your drives will now be able to check the route information on their phones using our app found on Google Play Store. To continue editing the routes, you can go to Edit current delivery plan. To create your own plan, go to Create new delivery plan. 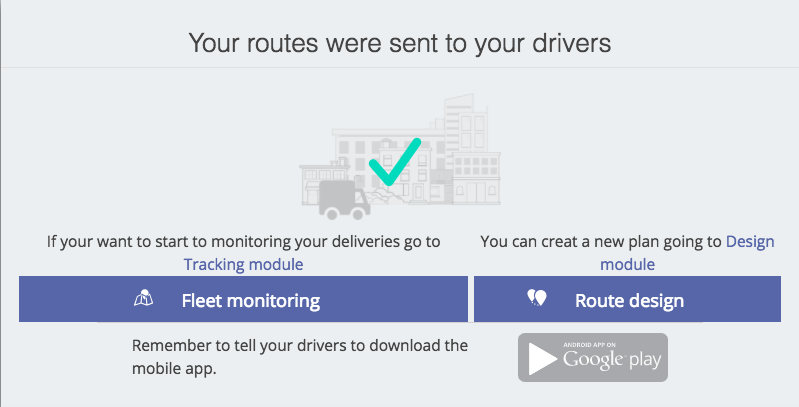 If you're all set and want to monitor your deliveries, head on to Monitor fleet deliveries.